Taste syrup (from local trees) on pancakes! Tours are ongoing from 10am to 3pm and will be ongoing so there is no need to preregister. Each tour lasts about 90 minutes. 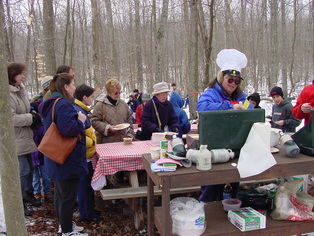 The day will feature a tour of the Sugarbush including stops to learn about Native American and early pioneer methods of making maple syrup, our evaporator process and methods of identifying and tapping a maple tree. After the tour, everyone will get a chance to taste some of our syrup on freshly made pancakes! Cost: $6/adult and $4/children under 12; all members of the EE Center and all tree sponsors attend free of charge. Please note only cash and check are accepted. Please dress to be outside and walking on potentially icy/snow covered trails. From I-80 take the Marshalls Creek Exit (exit #309) onto Rt. 209 North toward Marshalls Creek. Upon approaching the roundabout follow signs for Business Route 209 and Marshalls Creek. At the next traffic light after the roundabout, turn right and immediately get in the left turning lane. At this light turn left, and immediately after crossing the bridge take left fork onto Marshalls Creek Road. Proceed approximately 5.5 miles and look for signs on right-hand side of the road.